BYU-Idaho freshman Chelsea Castañeda said she wants to live healthier at BYU-Idaho, but her budget won’t allow it. She has to eat inexpensive foods that are less healthy than she wants. Her experience represents a large selection of BYU-Idaho students. She wants to eat healthier but can’t. A recent survey of campus shows that 52 percent said they had enough to eat, but they lacked the money to eat the food they wished to eat. The study by the Communication 440 class suggested that nearly two in three students at BYU-I have some level of concern over food. Either they have lost weight because of a lack of food, skipped meals or worried about having enough money for food, or not eaten enough of the food they would like to eat sometime over the last year on this campus. This compares national statistics that suggest only about 11 percent of Americans suffer with some degree of food insecurity. Only one in three students reported having what the government describes as high food security. The survey of BYU-I students conducted in early February had just more than 200 responses — a 13 percent response rate of the 1500 students reached. On the food insecurity measure, there was a .4 margin of error. A 6 percent margin of error existed on some simple yes/no variables at the 95 percent confidence level. Nationally, about 7 percent of households report low food security and 4 percent report very low food security. A recent study by the Government Accountability Office suggested that food insecurity is a large problem on college campuses. BYU-I does not, in fact, have a food pantry on campus. However, since many of the students in attendance are members in the Church, there are other options, like the bishop’s storehouse. Thirty-six percent of the respondents did not believe that struggling students would seek food assistance in times of need. Yet, the majority are informed of these resources. · Forty-five percent of married students said they had enough but not always the kind of food they wanted and 52 percent said they had enough of the foods they wanted to eat. Among single students, 56 percent had enough but not of the foods they wanted and 33 percent said they had enough of the kinds of food they wanted to eat. 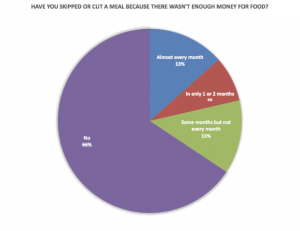 · Thirty percent admitted to cutting down their meals for the sake of others in their homes, while approximately 13 percent said that they did so almost every month. · Nine percent stated that their food just did not last and they could not afford to buy more. 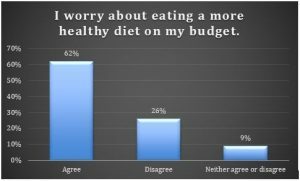 · Sixty-two percent worried about eating a more healthy diet on their budget, while 18 percent could not afford to eat balanced meals whatsoever. • Twenty-one percent of students said in the last 12 months at school they have been hungry some time because they lacked money for food. • One out of seven, 14 percent, of students claim to have lost weight because they lacked the money for food. · Seventy-five percent claimed to know of the resources that the Church of Jesus Christ of Latter-day Saints provides. Madison County has numerous resources available to those with insufficient food. Some examples include the Supplemental Nutrition Assistance Program (SNAP), the Rexburg Mobile Food Pantry, the Rexburg Food Pantry EICAP Upper Valley and more. An interesting survey. Sounds very similar to some of my college years! Starving, or having poor diet in college (plus stress and sleep issues), sets the stage for long-term health issues in the decades to come. There are also long-term issues for children born during these lean times. Sadly, what I thought was a short-term scarcity has continued ever since, as an employee of the university. I still don’t eat much better than I did in college. I often skip meals, or scrape together ingredients for imbalanced nutrition. I’m hungry as I write this! And we usually run out of food (and money) before the next pay check. My family is barely above the poverty line, as defined by SNAP. 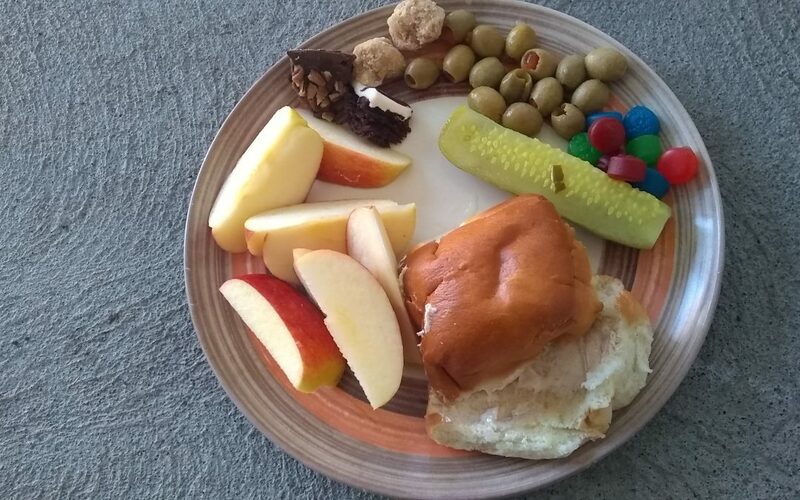 My kids get free lunches at school. We have avoided church assistance, because others are worse-off than we are. But we can’t afford health co-pays for preventative health care (dentist, etc. ), and we drive junk-yard cars and work extra jobs to get by. I’m not alone in this difficulty. Many administrative employees work at a 35% discount from industry standards, if not worse. I’m more like 50%. So claiming that students need even cheeper costs isn’t an answer (that wasn’t put forth in the article, I know). This is a very in-expensive school. But we do need more open dialogue about the real cost of living here, and not just for students!